A group of Japanese engineers are aiming to launch the world's smallest flying car, the Skydrive, in time for the 2020 Olympics in Tokyo. Designed by Cartivator, a Tokyo- and Toyota City-based non-profit run by a team of 30 volunteers, the three-wheeled Skydrive car is powered by four rotors and uses drone technology. The car aims to deliver a seamless transition from driving to flight. The team's "first target" is to build the flying car and use it to light the Olympic flame at Tokyo's 2020 Summer Olympics. Skydrive has a projected top speed of 93 miles (150 kilometres) per hour on land, and 62 miles (100 kilometres) per hour when airborne. It should fly at an altitude of up to 10 metres (33 feet). While a number of other flying car models are also under development – by firms such as Uber, Ehang and Airbus, to name just a few – Cartivator claims that its Skydive model will be the world's smallest at just 2.9 metres (9.5 feet) by 1.3 metres (4.3 feet). The firm envisions that Skydrive will be an infrastructure-free mode of transportation, able to take off and land anywhere. The team also hope that it will be accessible to all through the use of ride-sharing. "By 2050 we aim to create a world where anyone can fly in the sky anytime and anywhere,” said Cartivator. "To realise our vision, a compact flying car is necessary with a vertical takeoff and landing technology, which do not need roads and runways to lift off." 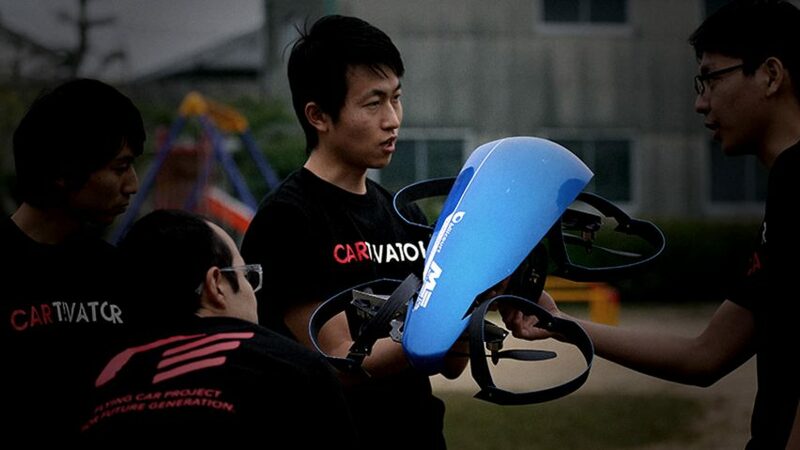 Launched in 2012, after project leader Tsubasa Nakamura and his team won first prize at business award KoreaRata for a flying car design, Cartivator is a non-profit organisation that relies on donations and volunteers, who work on the project in their spare time. The Cartivator team began developing Skydrive in 2014, when the first scale model prototype model was made. In May of this year, it was announced that the project had received a massive boost in the form of a donation of 40 million yen (£274, 000) from Japanese carmaker Toyota. Last month, the Associated Press reported that a test flight of the car in Toyota City saw the prototype "get up as high as eye level for several seconds before tilting and falling to the ground", damaging the propellers in the process. The team is using the money from Toyota to improve the design. It is aiming to launch the first manned flight by 2019 – a year before the 2020 Olympics in Tokyo, where the team hopes the flying car will be used to light the Olympic flame. The first commercial Skydrive model is expected to arrive just five years later, in 2025. The flying car project is not the only ambitious transportation venture currently underway in Japan. A proposal unveiled at the 2016 Geneva Motor Show by Foster + Partners and Nissan envisioned a "smart street" that can charge electric vehicles using wireless induction technology. Meanwhile, at this year's edition of CES in Las Vegas, Japanese company Honda revealed a prototype for a motorcycle that can move without being controlled by the rider and that won't fall over, while Toyota showcased a concept car equipped with an artificial intelligence system that picks up on the habits and emotions of the driver.